A rather goofy looking frog drawing but there is a history to it. Long ago (probably back in the 50’s/60’s) someone in my family, possibly my grandmother, purchased a couple of sets of placemats and napkins from the local arts center. These placemats had a formline frog image. Both she and my parents had a great fondness of indigenous art of Pacific Northwest coastal tribes. The placemats were used a fair amount and I recalled them from my childhood. A couple of years back I rediscovered them and wanted to create sets for each of my siblings. Last year I managed to purchase fabric and get things cut but it never advanced farther. Friday I started goofing around with the design, trying to see what works for my taste. It’s still super rough and will need more refining, but the idea is there. I’ve played around with some formline critters before in clay. Formline art consists of ovids, U and S shapes. It’s very much part of the indigenous coastal art (think Haida or Tlingit tribes). If you’re not familiar with it, you might want to check out Wikipedia. Below are failed vessel experiments I created about 10 years ago. The first couple are of an Orca design. 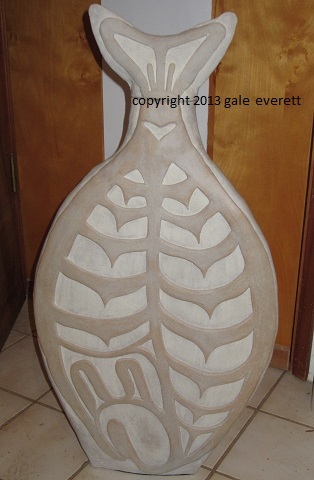 The finished vessel measured about 22″ long by 14″ high, by 7″ wide (ellipse form). It had a mirror image on the other side. Bummer it blew-out in the bisque. How was it created? 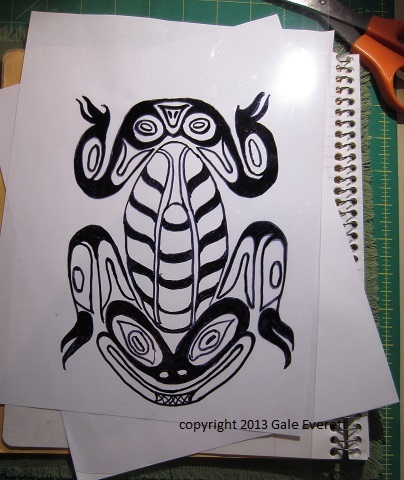 I transferred my drawing to a 1/4″ slab and created the cut out form. Then it was slipped & scored and attached onto an existing leather hard vessel. Way too many air gaps were created while trying to join the two together, plus the difference in clay consistency probably pushed the limits. Explosions in the kiln. Bummer! But I tried it again, thinking a second attempt would be better. Oh, I did destroy Orca #1. It only took a couple of blows from the hammer to do the job. Round #2 wasn’t as nice as the first. This time I used 2 distinctly different colored clay bodies (both stoneware), rolled them out and pancaked them together. 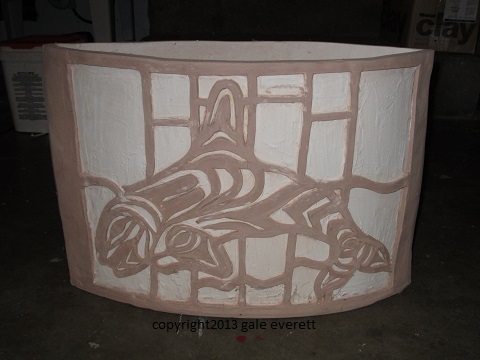 Then the vessel was built and image carved through the surface red layer down to the white. Looks like I did touch up of more white slip too. For some reason, I missed creating the spout feature and the rim. It surprisingly survived the bisque (with a few cracks) but was never up to snuff. 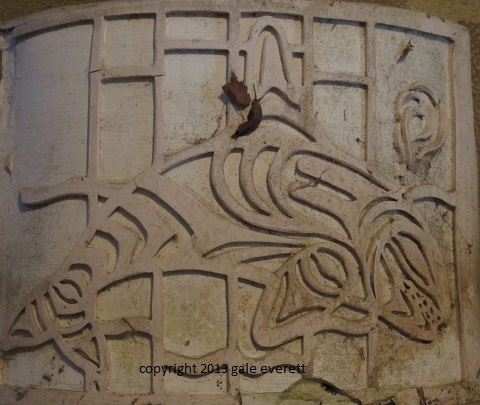 Now it sits behind the kiln holding crayfish nets. An ugly reminder of things past. It’s 30″x 15″ and 4″ wide at it’s base. The back side has all the negative forms. Several of the negative forms didn’t adhere well enough and cracked or peeled away from the surface. Oh well, another disaster. At least one side looked fairly cool. I had always wanted to attach twined cedar bark around the tail lid and create a halibut hook. It went through a high fire without any stain or surface glaze treatment. Raw clay in the fully cooked color. Hopefully something positive can come from the frog. My plan is to screen print it onto white fabric. Then I’ll hit it with fabric dye. If I can keep the dogs out of the mud and my time away from Eugene, it might actually be accomplished before Christmas! But I’m not holding my breath! These are very cool and yes, carving through slip would be a bit easier… perhaps a technique someone in my site specific class will want to explore. I’ll show these to them as an example. Ohhh, I can be part of “What Not To Do” lesson! Hurray! One of these days I’ll go back and MAKE that sculpture work for me. Ceramics are certainly uber challenging! Definitely a Pacific NW coastal thing. I’ve not seen it in other indigenous cultures.